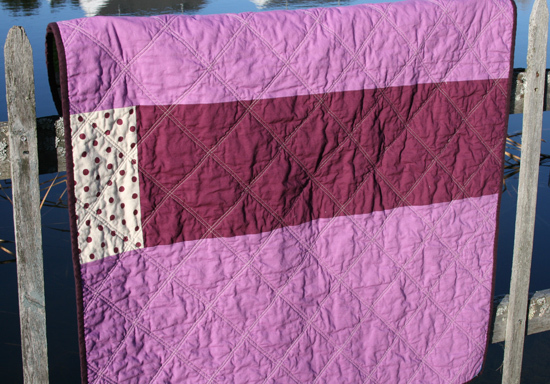 purple patchwork… with panthers, pigs and polka dots! Again, I’ve used a number of wonderful Etsuko Furuya prints – this time in shades of purple, turquoise and green, and I’ve added in several solids in shades of those colors. I loved this one from the moment I put these fabrics together, and it just got better as I cut them into squares and mixed them all up. There’s something about the purple, aqua and this shade of limey green that really draws me in… which is kind of weird, since I’m not usually a purple person. In fact, my stash of purple fabrics is nearly nonexistent, but now I’m thinking I really should do something about that! For the back, I went with a little more purple! Two solids in different shades, with a touch of the Echino dots in purple. I love to try out various quilting patterns on these quilts, so this time I went for double straight lines on the diagonal. I shifted it a bit so the quilting lines were offset from the diagonals of the squares. As usual, my description of this is probably lacking, but you can probably see what I’m talking about in the first photo in this post. This one measures 37″ x 40″, and makes for a fresh and modern baby quilt. Or I can totally picture it as a fabulous quilt for hanging out with a baby on the floor. Or even as a wall hanging… fun, right? It’s listed in the shop! 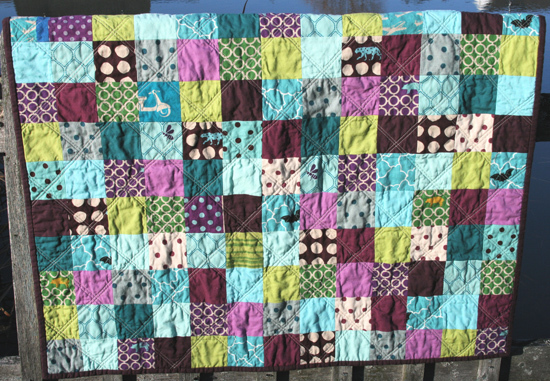 This entry was posted in [search] Charm Quilts, 2009 Finished Quilts, Finished Quilts, Posts about Quilts, Quilts and tagged Echino, Etsuko Furuya, handmade, kona solids, linen, patchwork, quilt, quilting, squares. Bookmark the permalink. 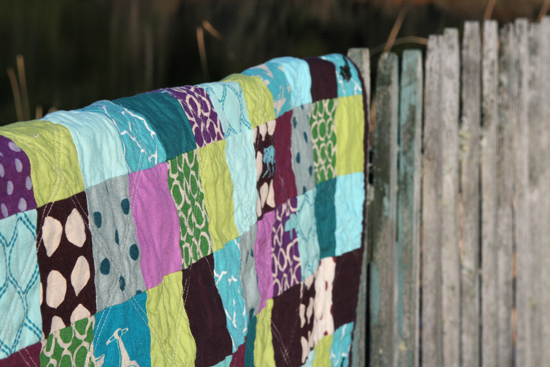 40 Responses to purple patchwork… with panthers, pigs and polka dots! this quilt is so unbelievably gorgeous! excellent work. Lovely! Did you do any strip piecing? Or did you just randomly piece this? I love it! I really like these colors. Also the quilting pattern is nice too, it’s simple but I like the double stitching. It’s lovely. I have a great idea for a tutorial. Have a tutorial on time management. I don’t know how you get all these quilts done. Purple is my favourite colour!!!!! I love to read your blog and see what new quilt you’ve been working on. Just a comment on the changes you’ve made to your blog format. With the post in it’s own limited width section, I cannot read the full width of it without sliding the scale thingy at the bottom, and I can’t reach it while I’m at the top of the post ! Is there anyway you can go back to the full width of the post showing at once? Oh! Wow! Your quilts are always gorgeous! First off, I have to agree with Dotty’s comment above. Secondly, the quilt is really cool. Great combination of colors. I splurged BIG TIME and bought a half yard of every Kona cotton solid from Pink Chalk. Yikes! Hi – same as Dotty’s post above, love to read your column, but since the changes it’s become harder to read (she details the problem better than I could). Thanks! Love those Japanese fabrics! Expensive though, hey? I love that honeybee in the comb. Purple is a lovely color! I think it goes together well with greens. Reminds me of an eggplant (the color that is). The quilting is very simple, yet beautiful. i’m not normally a purple person, either, but i love it here! nice color combo, Ashley! 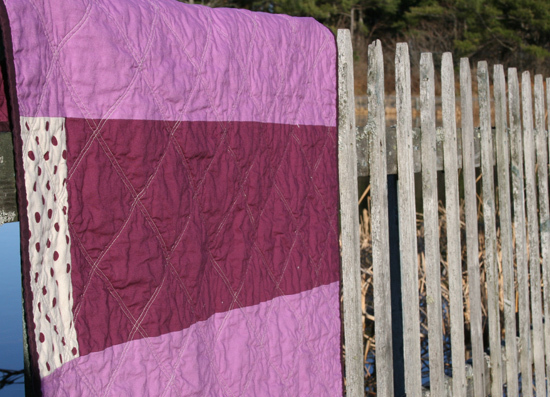 Purple usually doesn’t do anything for me but, oh la la… what a beautiful quilt! You’ve inspired me! I just bought a bunch of Odyssea by Momo and maybe this is all I need to do with it! Love the simple quilting too. I’m not a purple person either. But this combo so works and looks lovely. 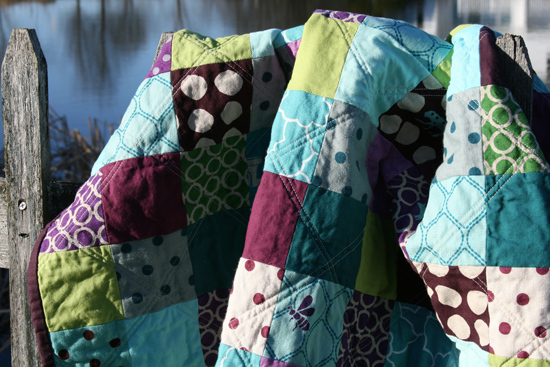 LOVE this quilt and the colours…purple and turquoise is just perfect! I love how the simplest patterns often look the prettiest and the diagonal quilting really goes well with this! This has got to be my favorite quilt that I’ve seen for ages. The green works really well with the purple. It makes it almost jewel like. Your quilts are forever amazing me, you have such an eye for color and pattern. Those deep rich colors are too yummy!! I love the way you mixed the colors/patterns together, beautiful. Love it. The colors are amazing together! I LOVE it!!! It is gorgeous! I like all the different colors together. The purple and blues are really pretty. I definitely think you should use purple more often. Cozy and charming; modern but very peaceful. I love it! This is fantastic. I really, really love the colors and fabrics you chose. I’m not usually a purple fan either, but I love what you’ve done with it here. It’s a great color combination! I love the machine quilting!! You can’t beat diagonals on squares. The colors are wonderful. Oh this is such a beautiful quilt! and cozy…i just want to wrap up in it! I love this quilt! I found it via your 2009 roundup. 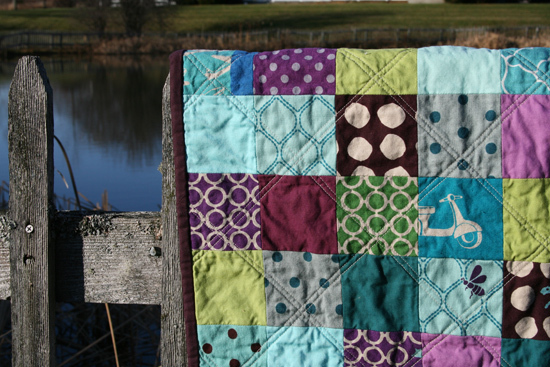 Great projects like this really inspire me and make me want to start quilting too! =) Especially in this beautiful colour combination! Can you tell me what size squares you use in the baby quilts. I LOVE this quit!! I would love if you could email me @ alyshanicole929@yahoo.com with some brief instructions if you have time. I am new to sewing and would LOVE to make a quilt similar to this. Thanks so much! Love it, love the colour combinations, a-ma-zing.